I never could get used to putting any kind of alcohol in tomato juice. I have tried to and to me it is horrible. If you want to try something crazy put about 1/8 teaspoon of baking soda in a glass of it mix it up and wait a bit. It kills the acid and makes it sweet. This is what I do with store bought tomato products that have been over dosed with citric acid for so called safety reasons. You just reminded me of a homemade tomato soup recipe I used to make a lot. The last step was stirring in some baking soda. I need to go find that recipe! Keep in mind that to try the experiment it has to be after it is canned and you are ready to drink it. You might want to try it on some store bough stuff. My mothers never was that acidic and one of the reasons I cant drink the stuff. Homemade I can but certain brands from the store kill me. Cento brand doesn't do it to me. I have some 250ml canning jars so I thought about using those to test out different concentrations. I'm sure they add it before, to acidify it. I just dont know what the chemistry is for the I think one teaspoon of citric acid to 1 quart of tomatoes. Or what ever it is I will have to check tomorrow. Yes, you add it to the jars when you are preparing them for canning. The NCHFP did lots of testing to see which strength would assure that a wide range of tomatoes would be at the safe pH after spending time on the pantry shelf after canning. I just go by their guidelines instead of worrying about testing pH with a meter...although it would be interesting to see how much it varies before canning, after canning and after a month or so later. I was wrong it is 1/2 teaspoon per quart. I've often posted about how much I reduce the liquid and pulp after I cut up and run the tomato chunks through my Back To Basics Food Mill. Today, I had five big popcorn bowls full of chunks and it was time to make juice. My keys to reducing the water out and achieving thick juice is shown in the pictures below. The stove gets turned down as low as I can get it and still get a very slow roll to the contents of the pots without getting any bubbles in that roll. You can see where the two eyes are set in the pictures. Our stove is a glass top and I really love it. I used one 8 quart pot and one 12 quart pot and started with only about 1 inch of space at the top of each one. I actually thought about making this post when I was an hour into the process. When I was done, I had 12 quarts and one pint of juice canned. This was a good run. The first three pictures show the starting point of the liquid in the pots (just above the rivits for the handles) and the settings on the stove. The fourth shows how the slow roll only keeps a small area in the center clear of the foam. The last picture just gives an overall view. Remember, you have to keep the heat down low enough to get the liquid to roll slowly. This allows hot liquid from the bottom to slowly rise and give off steam. But you can't do a fast hard roll with bubbling action because it will scorch and/or burn the juice and ruin the taste. Patience is the real key to success. The reduction rate actually speeds up as the percentage of water gets lower and lower. I'm having some difficulty with something and went and reread the entire thread. I just made another batch of juice (about 7 quart jars filled) and it came our great.... For cooking. The first batch as well as this batch have a "cooked" taste to it that I simply don't enjoy for drinking. For the second batch I really kept the heat down but it still has that cooked taste to it that just doesn't do it for me when drinking it. Now I'm wondering if the the heat I'm using is simply still too high..? There was no sticking on the bottom of the pot and there was a slow rolling boil. I'm think for the best batch I must simply keep the heat super low for a much longer period of time maybe..? This latest batch still took the best part of three hours to make. I really want to get this right. 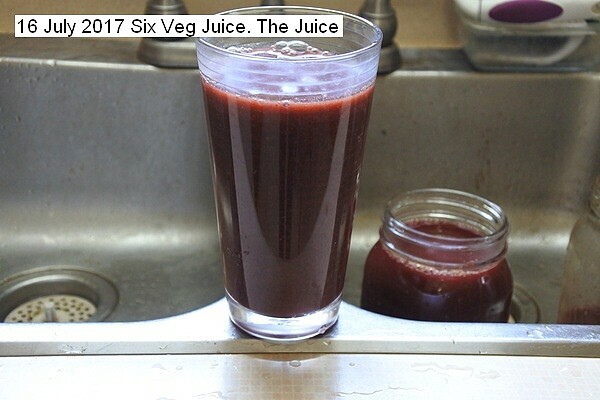 Six vegetable types from the garden were processed into juice. The vegetables were dill 1/2 pounds, celery 1 pound, basil 1/2 pound, beets 3 pounds, carrots 1 pound, Parsnips 1 pound. The beet and carrot tops were used. No condiments were added, pure INJUN cooking. The seven liters of juice was pressure canned at 15 PSI for 15 minutes for long term storage at room temperature. Annotated pictures depict the procedure. Was that a table spoon per pint? Way longer than you need them to. Last edited by Worth1; September 16, 2017 at 09:53 AM.